Reagan slept last night!!!! 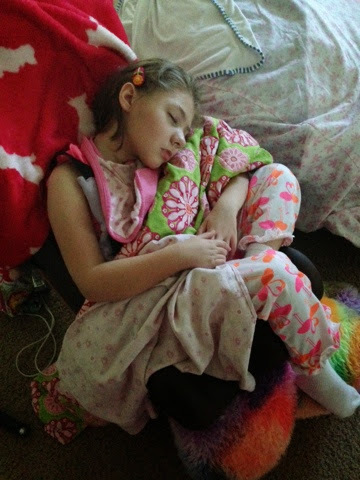 Granted, it was in her chair (because I was too scared to try to move her), but she slept nonetheless! She woke up this morning around 6:30am with a scowl on her face. She's been very serious/scowly all day today. Not as still as yesterday, but not flailing around either. Not gaggy but still sticking her tongue out and smacking here and there. This morning she had a BIG poo diaper and we decided to just go ahead and give her a bath right then. I'm glad we did, because she dozed off shortly thereafter (while PT was working with her). She slept for a bit and then woke back up just in time for OT. Unfortunately, for OT, she dozed off right as she got here! She slept for a while longer and then woke right around 3:30pm. She was awake until 8:30ish when she dozed back off again. Hoping we can get her into her bed without her waking up! Praying for sleep and smiles for my girl! Reagan had a HORRIBLE night last night. Super nauseous, I was afraid to leave her side...and I didn't until close to 1am. She seemed to be doing a little better, although not asleep, so I laid down. I got back up with her several more times...it was a LONG night. The nausea has definitely been better today, no actual throw ups and maybe not even any retches (she was on just pedialyte all night), but lots of other things that point to her still being nauseous (teeth grinding, sticking her tongue out, super spitty). This morning she had her follow-up with GI. Talk about good timing. Ryan was a handful (that's why I usually try to leave him with Grandpa for Reagan's appts but Grandpa is out of town)! We spoke to her doctor about everything (recent increase in nausea and "off" days) and the game plan right now is to increase her milk of magnesia (in an attempt to get her more "regular") and increase nortriptyline (from 5mls 3x/day to 6mls 3x/day). Because this medication has the potential to mess with her heart, we had to take her over to get a baseline EKG before increasing it (thankfully they were able to squeeze us in so we don't have to go back)! We also discussed potentially switching her formula again, but we're going to try this first (he does want another gastric emptying scan and abdominal ultrasound though). PRAYING this works! She was still very tense today, super stiff and difficult to maneuver, lots of chorea, and vocal/easily agitated (which made for an interesting car ride with her brother)! 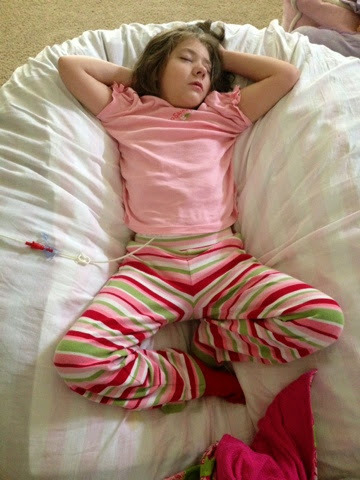 After we got home, we decided to try clonidine (we had given her oxycodone on the way to the doctors office and it didn't do a thing). The clonidine helped her doze off for the first time in a long time. Unfortunately it only lasted 30min or so, but when she woke up, she was much more calm. Legs were still and she wasn't even trying to jam her hand down her throat! She dozed off again for a bit and then was just very calm but awake (and spitty) for the rest of the night. I gave her clonidine again around 10:30pm and as of now, she's asleep! Prayers that my girl can get a good night's rest (even though she's still in her chair) and wake up tomorrow feeling SO much better (or keep sleeping)! Well, things have definitely gone from bad to worse. Reagan was up nearly the entire night last night and she was miserable moaning off and on! I had to move her to her chair at 1:30am, then again at 2am she was fussing, and again at 4am, and then I got up to run at 6am. Needless to say, I'm exhausted...we're all exhausted! My poor sweet girl is exhausted...and now she's nauseous again. She had therapy today (PT & OT) and did very well, considering. But as the day went on, the nausea got worse. And her chorea is still out of control and she's jamming her fingers down her throat (which REALLY doesn't help when she's nauseous)! Tonight the nausea was relentless. LOTS of throw ups. Lots of retching and gagging. It's painful to watch. And you have to be vigilant, sit literally right on top of her, because it could happen at any moment. Her throat is quite junky from all of the gunk that's been coming up, but hopefully it's just her throat and it's not getting into her lungs. As luck would have it, we have a GI appt tomorrow morning. We will definitely be going over our options and try to figure out our next steps if this nausea does not stop on it's own. My poor sweet girl. I just hate to see her suffer like this! It's been so long since we've seen this kind of nausea, but there has definitely been a gradual increase in the last week or so (and I don't like it one bit)! Tonight I gave her her pm dose of clonidine early, hoping it would help her to doze off, but instead it had the opposite effect, making her irritable and fussy (heartrate in the 170s)! After a while of that, I realized it wasn't getting any better, so thankfully a dose of Lortab was just what the doctor ordered, and she was eventually able to settle down and fall asleep (her heartrate is down in the 120s now and her O2 is in the low 90s but that's because she's got her head tilted to the side). PRAYING she can stay asleep and that the nausea is gone by morning. Please keep her in your prayers! Today we haven't seen the improvement we were hoping for. Reagan had another very restless night sleep. She just looks exhausted. And to top it off, her chorea is out of control! So she's exhausted and moving nonstop! Poor thing! Still wanting that hand in her mouth, but she's very bitey, so we have to keep it away the best we can. She was also pretty sensitive today and flipped out a couple of times. 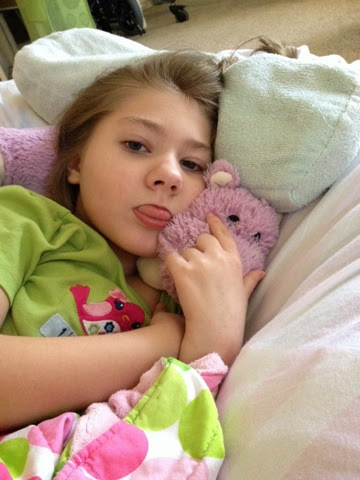 Her nurse gave her oxycodone and clonidine and while both seemed to take the edge off a little, neither was able to relax her enough so she could rest and both were only temporary fixes, they did not last long. We were able to get her in the bath tub, but it was a struggle as she was very kicky and flaily! And tonight she was sweating herself wet, so not sure how much good that bath did. We really have no clue what's going on in that body of hers. Are things going to get better...they sure haven't in a while! I'm so frustrated for her! Praying for better days for my girl! Today was very similar to yesterday. 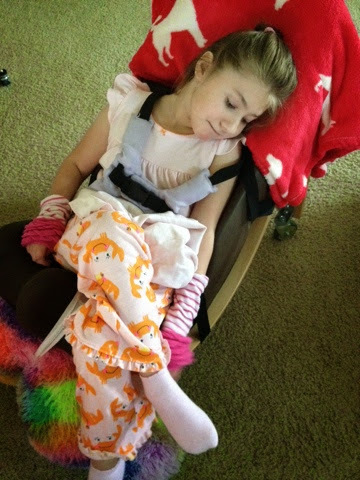 Reagan slept in her chair last night, she did wake up fairly early, but I think she got some sleep. Today she's continued to be tense, vocal with over stimulation, and just overall a little kooky. She did not nap at all today. Her nurse gave her oxycodone at one point to try to take the edge off and hopefully allow her to rest...didn't happen. She's still very crunchy, hands in the mouth A LOT, lots of chorea, a little gunky in her throat at times but no actual nausea (but she's still getting Zofran). Not exactly sure what these days are. Are we headed toward bad days, are these milder versions of her bad days??? No clue. It's hard to get your bearings when you have no idea where you stand! Hoping and praying for her to settle down in the upcoming week and actually have some legitimate 100% good days (I honestly don't remember when the last one was)!! Now, on to trying to get this restless girl to sleep tonight!! Did I mention she was bitey? But still giving us little smiles here and there! 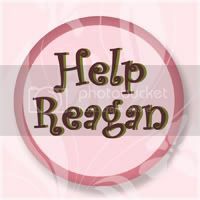 On a good note, Reagan has not had any nausea today (thank you God), but on a bad note, she just hasn't been feeling well! This morning I found her stuck flat on her tummy, unable to turn over! Her eyes were still closed though, so I just repositioned her and left her for a while longer. Not sure how much quality sleep she got last night. She's been very moany/groany today, escalating into tears at times. She's having lots of gas, so it's very possible that her tummy is what's ailing her, but there's no way to tell. She's super tense in her body, very crunchy (she reminds me of a rolly poly), biting at her hand nonstop...so I've spent most of the day trying to keep her hand out of her mouth and giving her breaks from sitting in her chair (her preferred positioning). She's done OK on the floor, but her crunchiness just makes her roll over to her side a lot. In general, she's just fussy. Whiney...moany...pretty miserable! She did sleep off and on thanks to Lortab and clonidine. I always hold out, not really wanting to give her any more medications, but some days they are just necessary. We didn't have a nurse today so were actually hoping we could load everyone up and take a little road trip. That did not happen. Today just wasn't the day. Reagan was also pretty sensitive to noises and sounds (especially music on tv), so it worked out better for me to just stay upstairs with her most of the day. Tonight she reluctantly dozed off in her chair and I didn't dare move her. It's a very restless sleep so I'm just keeping my fingers crossed that she's able to sleep through the night. She really needs some quality rest! Reagan slept well until 4am or so. I could hear her moving around, so Mike got up and went in there. She wasn't falling back asleep though, so around 4:30am, I decided to move her into her chair (my concern was her laying flat and getting nauseous). Once in her chair, she actually started having bouts of fussiness. They'd come and go. I definitely think something was hurting her. Poor girl. I gave her a dose of Lortab and she finally dozed back off around 5:30am. This morning she kept sleeping and we actually thought she might sleep all day! She did however wake up around 9:30am, just in time for PT. At first she did fine, although she was very tense in her body and slightly gaggy, but the more her therapist tried moving her (and stretching her), the more irritated she got, fussing/whining. Her nurse did give her a dose of oxycodone to try to calm her down and that seemed to help a little. 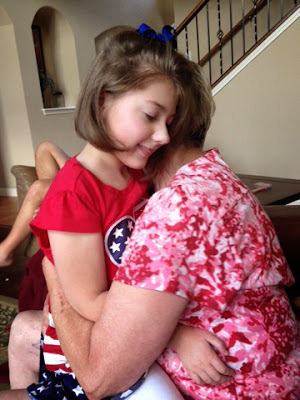 Her speech therapist saw her immediately following PT and she just took it easy with her. My poor girl was definitely not feeling well. 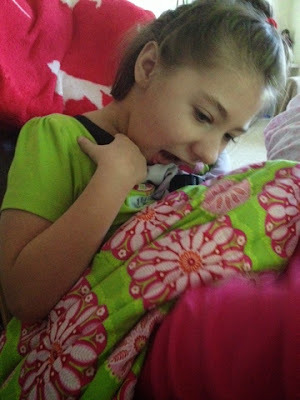 Her nausea just continued to increase, lots of mouth movements and retching, which was only made worse by her continuously shoving her fingers down her throat. She was desperately in need of a bath, so while brother was napping we managed to give her a quick bath, but it was a difficult task with such a gaggy girl (diaper changes were equally as challenging). After her bath she dozed off and slept the rest of the afternoon. Every now and then she'd flail around and try to put her hands in her mouth (and gag) while keeping her eyes closed, but just holding her arms down would help her to settle down and fall back to sleep. She woke back up around 30min or so before her nurse left, stayed awake long enough to have her diaper changed (only the second of the day), and move downstairs where she later fell back asleep! Hoping she makes the transfer into her bed and gets some sleep tonight (and wakes up without nausea tomorrow)!! Even with all the nausea she had today, there were no throw ups, so hopefully we're headed in the right direction!?!? So last night didn't go as smoothly as I had hoped! Reagan was getting sleepy, so Mike went and laid her down, but she wasn't really dozing off. She was kicking around and flailing her arms, and when I went in to check on her, she escalated. She started getting vocal and I could tell, we had to do something quick! I gave her a dose of Lortab and it almost immediately calmed her down! After that, it was smooth sailing! She slept through the night as far as I could tell. I did get up at 6am to find her kicking around, so I recovered her and she fell back asleep for a bit. She's been in a much more calm mood today. No more crazy laughs, but very smiley and sweet. 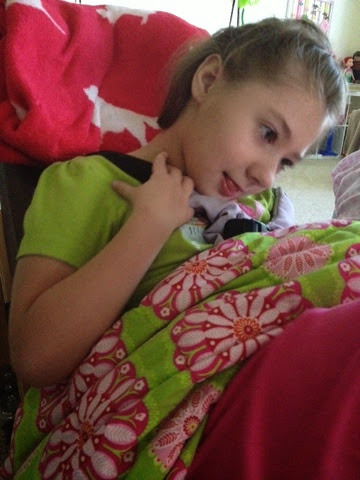 We had her all dressed and ready to go to her neuro appt this morning, when I decided to call just to confirm the appt (they hadn't given me a confirmation call so I was slightly concerned). Well, good thing I called, because they had taken it upon themselves to cancel her appt! Aghhhhh!!! I was slightly annoyed, so the nurse managed to squeeze us in for a 3:30pm appt. Since we were free, Ryan and I went to lunch with Mike, where Ryan proceeded to pee all over the floor as if he didn't have a diaper on at all!!! Not sure what happened, but he must've had a serious diaper malfunction, because he made quite the mess! Thankfully we were already finished, but he was not a fan of riding home sitting on a chux soaked in pee! 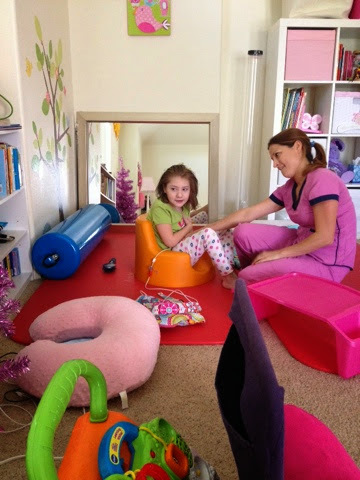 While Ryan napped, Reagan was able to squeeze in a quick PT and OT session before we had to leave for her appt. She was slightly sensitive to sudden movements (during PT and OT), but otherwise OK. She had a small (seemingly out of no where) throw up right before we left for her drs appt. Otherwise, she was great! Super smiley and sweet! And still! We had to explain to her neuro that she's never this still! Legs weren't kicking, hands weren't in the mouth...very unusual! 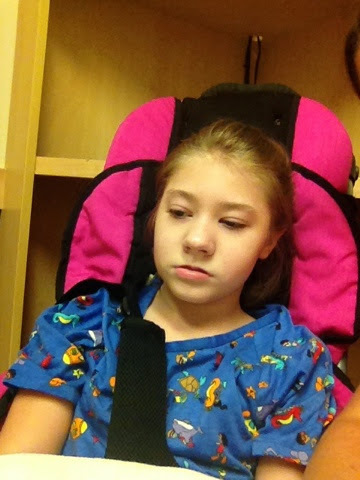 Her neuro went over the results of her MRI. Everything was basically similar to her previous MRIs. So, in this case, no change in an MRI, is good news. There was thinning of the corpus collosum and potential decreased white matter, but these are common in kids with developmental delay (and have been seen in her previous MRIs). As far as her seizure medications go, he is of the opinion that we shouldn't change a thing, don't fix something that's not broken. If we see any more quirky movements, he wants us to video them and then email them to him. 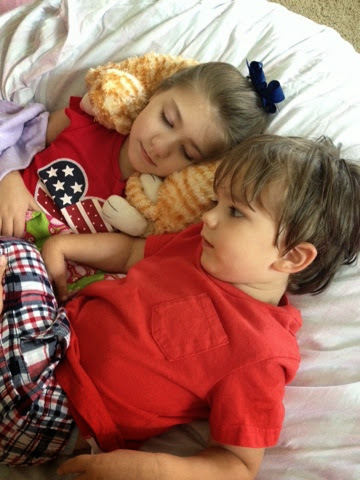 He's definitely letting Reagan's other doctors take the lead right now, but I can tell that if we ever needed his epilepsy expertise (which I hope we never do), Reagan would be in good hands. I really like this neurologist. He's very personable (which is rare in a neurologist), but you can tell he's always thinking, obviously a very intelligent guy. Glad he's on our team. So after our appt, we ran upstairs to get her blood drawn (just checking her liver enzymes and Banzel levels). Reagan is such a pro! Piece of cake! We were in the car and heading back just in time for 5 o'clock traffic! We had a night nurse tonight because it's Bible study night. 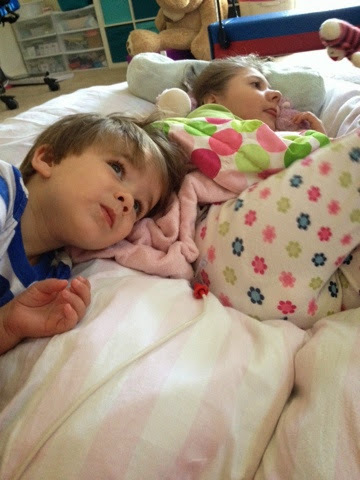 Ryan went over to our neighbor's house to play and the night nurse stayed with Reagan. Unfortunately Reagan had another throw up right around 7pm and then another one an hour or so later. No gagging or retching in between, thankfully, but there were signs of increased nausea. An increase in spittiness/swallowing, tongue protrusion, and biting her lower lip. She continued to be sweet and smiley though. When I got home from Bible study, I picked her up and held her until bed time. She was VERY sweaty. Cold, clammy hands and feet and super sweaty body/back! Poor girl! Her temperature regulation is definitely out of whack (and I could smell "bad day smell" on her head)! She eventually dozed off with the help of clonidine and Mike was able to lay her in her bed. Hoping she's able to stay asleep! Please keep my sweet, nauseous girl in your prayers! Reagan slept the whole night through last night! She woke up around 7:30am and was still very vocal but OK. She had a bit of a meltdown (tears and all) when I opened the garage door this morning, but after that seemed a bit more calm. She was still vocal off and on all morning, but she definitely mellowed out a bit as the day went on. Her body also quieted down quite a bit. She was a lot more still and would even sit for periods with her hands down beside her side. 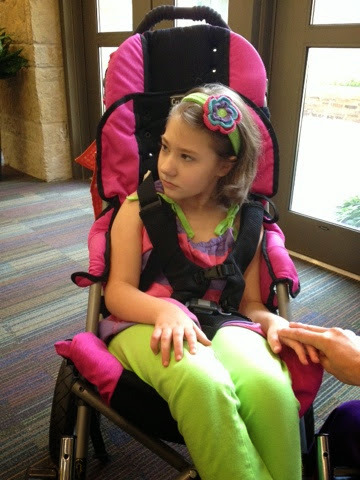 She had speech and OT today and she did well with both. No explosive diapers, but she did have one small throw up this morning. Not sure what that was about, but other than some tongue action, she didn't really seem nauseous or anything. Hoping she's over that (whatever it was). She was also a lot more tolerant of her brother today, she wasn't a fan of us talking in the morning, but as the day went on, it didn't seem to bother her anymore. Hopefully this means we're on an upswing! Sure would be nice to have some good days for my sweet girl! She so deserves them! Reagan slept in her bed til about 4:30 or so, but I was afraid to just leave her laying flat like that for too long, so we moved her to her chair. She dozed back off and slept for a while longer. She was very vocal all day today. Lots of crazy, nervous laughing. We had to be careful about not overstimulating her, because she was laughing but still very much on edge (thankfully no nausea). She only had one therapy today, OT, and she did OK with that. She did have two huge liquidy diapers, so it's very possible that maybe she did pick up some sort of stomach virus from her brother?!? It's hard to say. I feel like if I had seen her nausea episode yesterday I might have been able to distinguish whether it was typical for her nauseous days or if it was a different sort of "sick" nausea, but I was at a drs appt and the nurse that was here with her had never seen one of her nausea spells, so it's hard to say. She was kooky but stable most of the day yesterday (and no more crazy heartrate issues). However, right as the nurse was leaving and Mike was bringing her downstairs, she started crazy laughing/crying! Her nurse gave her Lortab and I think that took the edge off for a little while, but she continued doing that off and on the rest of the night. She seemed to calm down when I'd pick her up and hold her, but it took some coaxing, she wasn't easy to console. I was skeptical that she'd ever go to sleep. I was holding her and she was yawning a lot, but still very vocal (right in my ear) and on edge. Mike finally went and laid down with her, but she continued to be very vocal. When he came to bed she was still making a lot of vocalizations, but I went in and checked on her and her eyes were closed! Hopefully she's able to get some sleep tonight! Poor girl, I have no clue what's going on with her or even which direction she's headed at this point, but she could definitely use some better days! So today definitely got started on the wrong foot! Reagan woke us up around 6:20am. She was making some noise so Mike was just going to pick her up and put her in her chair, but when he got in there he found her soaked in throw up! She had it all in her hair, down her arm, and on her shirt! Poor thing! We cleaned her up and put her in her chair and she seemed fine. Then around 9am she had another pretty big throw up, and then another little one a little later, and then a huge one around 10:20am. After that one, she got a little sleepy, so her nurse decided to check her pulse/O2 and her heartrate was through the roof 180-200 (even though she was acting fatigued). We decided to give her some clonidine to try to calm her down a little and help her sleep. She dozed off and her heartrate went down to mid 140s. Her pediatrician wanted us to bring her in to get checked out at 11:45am. So we dragged sleeping beauty out of the house to the doctor's office. They took all of her vitals in the office and other than a lower than normal blood pressure (probably a result of the clonidine), everything was normal. Her heartrate was in the 120s and he O2 sats looked good. We decided to switch her over to pediatlyte for a while and then slowly reintroduce formula. We are also checking her vitals on a regular basis. Everything looks good for now. We changed her diaper and I held her for a bit around 5pm, but she did get a little spitty and look slightly gaggy. 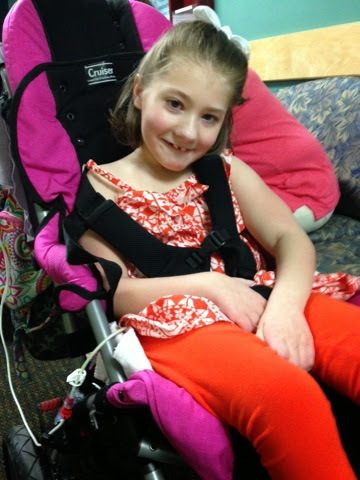 You can just tell she does better in her chair when she's more upright and better supported. On a fun note, we're still dealing with major diarrhea from her brother...yesterday morning and this morning he had HUGE liquidy diapers that leaked all over the floor (ever since his throw up incident last Wed)! And then this morning I also threw out something in my back (again)! I would equate the pain with labor pains! Thankfully, I took some pain reliever and have managed to make it through the day without any more debilitating incidents! Hopefully I can get out of bed and still do my morning run tomorrow! So...needless to say, this day has had way more of the bad kind of excitement than I would like! Prayers for no more nausea and good days for my sweet girl! Reagan had an OK day today. She slept well but she's been a little kooky all day. Pretty tense in her body, easily excitable (and vocal)...just a little more on edge than I'd like to see. I had wanted to take her swimming, but I think it just wasn't the right day for it (plus the pool felt a lot cooler to me...even Ryan was hesitant at first to get in). Hopefully we'll get her in the pool this week. I'm counting on a good week for my girl! Tonight she took a bath with Grandma (Grandma wears her swim suit and let's Reagan float in the tub), she seemed to calm down a bit after that and the rest of the night she was pretty easy going! Hopefully she'll get another good night's rest tonight and wake up smiling in the morning! Reagan slept like a rock last night and then continued sleeping most of the morning. When she did finally wake up, she was very serious and tense. Lots of kicking and furrowing of her brow. She didn't really want to be messed with and the more we tried, the more irritated she seemed. Her nurse noticed that her left leg seemed a little swollen (but it looked fine by the end of the day). We also noticed that her extension are just spinning around in her button (her gj tube). Whatever it is inside that locks her extension, must've broken off. The only thing I can think of is that she grabbed and yanked her tube last night (she's been very grabby today), because it wasn't doing this yesterday. It's nothing to be immediately concerned over, it will probably just need to be changed out a little early this time around. She dozed back off in her bean bag chair and slept most of the afternoon (her weekend nurse is beginning to think she bores her)! She woke back up around 7pm and was still pretty tense. She wasn't sensitive though and she tolerated hanging out downstairs with everyone just fine. Tonight she seemed to calm down a little and when I picked her up and held her, she immediately fell asleep! My sleeping beauty girl! Such a doll. 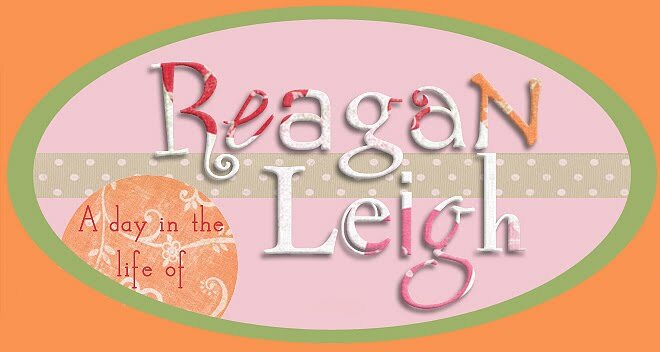 All went well with Reagan's procedures today, so thank you all for your prayers! I will fill you in on all the details tomorrow! She was a rock star! I think Reagan slept well last night? I only heard her once during the night (around 4am) and she let out a squeal, but then she stopped moving and as far as I could tell, went back to sleep. She was also very still when I got up at 6am to go running, but when I got back she was awake and as Daddy described "crazy"! She seemed fine for me though, so maybe it was just Daddy setting her off again? She's had a pretty good day today. She had OT and PT and did fairly well with both considering. She's still very crunchy and tense (PT worked on that a lot) and she's still showing some signs of nausea (sticking her tongue out, grinding her teeth, and a little spitty). As of now, we're still planning on doing the MRI/ABR tomorrow. They called us to tell us we've been bumped back a little later (so our arrival time is 10:30am and the first procedure should start by noon). That should work to our advantage. We'll have more time to scope her out and decide if it's going to be doable or not. I figure if she's supposed to have this tomorrow, everything will work out and she will clearly let us know if she's up for it, if not, then so be it. We'll reschedule again. So just keep it in your prayers that we will clearly know God's will so that we can make the right decision! Reagan had a very restless night last night. She fell asleep with the help of clonidine, but it was a restless sleep and by 4am she was wide awake with all of her covers kicked off! I got up, got her all straightened out and covered back up, but I don't think she ever went back to sleep. She sounded a little agitated so finally around 5am, Mike just put her in her chair in the playroom where she could watch cartoons and she seemed to prefer that. She was actually being pretty sweet and precious this morning and it seemed like it might be a good day. Ryan slept in, which is very odd for him (we did hear him up coughing at one point so we weren't sure how well he slept). He seemed to be feeling fine when he woke up and he guzzled down a full cup of milk. He was on his second cup when I got him dressed and we were headed out the door when the projectile vomiting started! It was A LOT of vomit (all of the milk he just drank) and the poor guy had it even coming out of his nose! He settled down and we just took it easy the rest of the day. Lots of juice to drink, which he loved (it's really just 25% juice, 75% water, but he loves it) and starchy foods like toast, rice, and crackers. He was fine the rest of the day. There were a few times where it seemed like something might come up, but it never did and he otherwise seemed perfectly normal (except for the 3 diarrhea diapers). Anywho, Reagan was OK yesterday. Similar to previous days, very sensitive to noises...we had to keep the television turned all the way down because any little song would send her over the edge. She did freak out when Daddy tried to talk to her when he was home for lunch (tears and all), but she quickly calmed down. I think it's just the tone of his voice that sets her off on days like this. Tonight she got very spitty and was doing a lot of the smacking and swallowing. She had a huge retch and I would have sworn she was going to throw up, but she never did. I did start the Zofran. She did get sleepy thanks to clonidine, but she was just too nauseous to put in her bed. Mike transferred her to her chair where she got a second wind and actually started freaking out a bit. I held off, thinking maybe she'd eventually fall back to sleep, but I did have to finally give her Lortab. That almost instantly calmed her down and she was able to fall asleep. 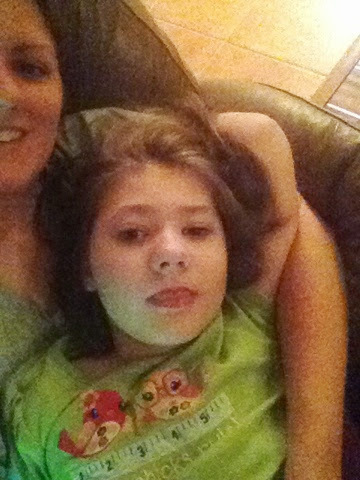 Hoping she can stay asleep and that the nausea leaves her alone tonight. Poor girl. Not sure what any of this means for her MRI Friday, but we will just wait and see. Today is actually Day 11 since her last bad day. I definitely wouldn't call this a "bad day", but she's most certainly on edge. Prayers for both my girl AND boy!! Today was very similar to yesterday. Reagan slept well, woke up with some smiles, but still very tense and kooky. She was a little more sensitive to noises (and her brother) today. We had to be more careful talking around her, although she never cried, she did vocalize very loudly in disapproval. She had OT and PT today and she did OK with both. She's still just so tense, it's making everything more challenging. She's also still having some temperature regulation issues and very much into her hand. She was super sweet and cuddly tonight, although it was still a battle with that hand! A little more lip smacking and spitty/swallowing than I'd like to see. She also HATED any commercials that came on with music! Immediately she'd start getting upset! Hoping she's going to wind down and sleep tonight. She's definitely looking sleepy (lots of yawns) but restless! Reagan continued sleeping the whole night through last night! Actually, this morning when I went in to check on her, she was laying there so relaxed that she had both arms up behind her head! Too cute! She woke up smiling today but is still pretty kooky. Her body is tense, of course sleeping for 36 hrs straight could make you a bit stiff, but she's been very "crunchy". Her OT did a lot of stretching to try to help her with that. She ate a little in speech but then dozed off about halfway through her session. She took a pretty long nap this afternoon and woke up a little tense but OK. It's a weird sort of streak she's on. I'm not sure which direction she's headed or what to expect! We've still got that MRI/ABR scheduled for Friday, so we probably won't know until the day before or the day of whether or not we're going through with it! Hoping we're in for at least a few (real) good days this week! To say it's been a sleepy day for my girl, would be an understatement! She slept the whole night through last night and then just kept sleeping, sleeping, and sleeping all day long. I haven't seen her open her eyes once. She'll move around and stretch and even kick her covers off, but never actually wakes up! Obviously her body needed the sleep! The good thing is, she has been smiling in her sleep, so hopefully when she wakes up, she'll be feeling better and ready to have some good days! I still have NO clue what to expect over the next week, but I'm hopeful that we're finally in for some good days! Today was another weird day for my girl. She had a restless night last night, I'm not sure how much or if she slept. When I got up this morning she was quietly laying in her bed wide awake all covers kicked off. For most of the morning she was very calm and quiet, hands by her sides...very still. Only the faintest of smiles. Then by afternoon, the chorea picked back up and the hands went back in the mouth! Her temperature regulation is still SO off...her hands and feet are like clammy icicles and her body is constantly overheating and she's sweating her clothes wet! She does best on the floor but we can't leave her laying down too long because she's also been a little spitty/chokey. Lots of tongue action and she's still biting on that lower lip (but not as much). We honestly have no idea what's going on. This is not the kind of day we would expect to see after a bad streak! When is she going to go from "off" to good? Or is she just going to jump right back into the bad again? We have no idea. Hoping for some sleep and some better days for my girl! Reagan slept OK last night. 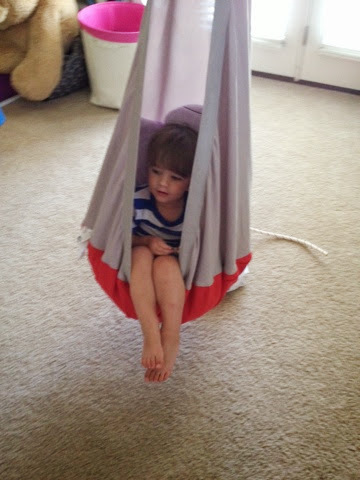 She was awake and laughing by 4 or 5am and then Mike finally moved her from her bed to her tomato chair around 6:30am. She's been kooky again all day today. Very laughy, but the whiney sort of laugh that doesn't really sound happy, more sad. She had OT this morning and her therapist did a lot of mat work with her, which is great on days when she's a little on edge. She did almost freak out when her therapist was leaving and telling her goodbye, but she settled down and recovered. After OT, she had speech. It was definitely a modified sort of speech session because we had to be really careful about talking around her, but she did do a little feeding therapy and seemed to enjoy that. This afternoon she really seemed to be escalating and uncomfortable. We finally decided to try to some Lortab and that seemed to help (for an hour or so anyway). She settled down and was a little less vocal, but just seemed more comfortable for a little while. Her temperature regulation has been WAY off today and she's biting at that lower lip, but not crazy biting. We have no idea what's going on with her on days like this. Is she in pain, is she having some sort of manic (neurologic) episode that she has no control over? We have no idea! I'm really hoping she'll pull it together and get back on track to 100% good days! I would sure love to her to have a good weekend. 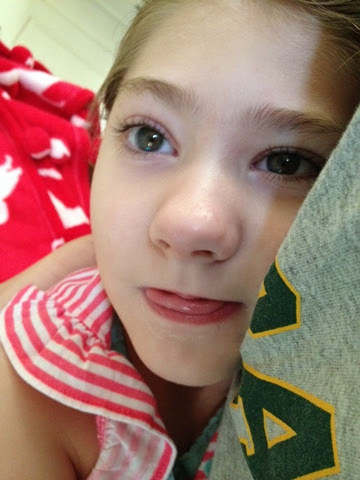 Next Friday she's scheduled to have her MRI/ABR (this is the one we've already had to reschedule once). Hopefully it will happen this time. We'll see! Tonight she's been less crazy and more just plain sweet. It's been an odd sort of day for my girl. She slept OK, but the restless sort of sleep I think. She's been sensitive and laughy all day today (laughy in a crazy, on edge sort of way, not the good way). We've been very careful to keep stimulation to a minimum and that has helped. She only had one therapy today, PT, and she did OK with that. She spent most of the day just chilling out in her bean bag chair, trying to take it easy. Her head has felt a little warm to me all day, but no fever. Tonight her temperature regulation was WAY off and she sweated her pjs wet requiring a full outfit change! I can also smell the "bad day smell". Something we haven't really noticed a lot lately, but in talking with her metabolic specialist, it's often related to an enzyme/vitamin deficiency. He said there are certain things that he can smell several rooms away and knows immediately what the issue is! I told him that we need to bring Reagan in the next time she has the "bad day smell" and have him smell her! He kinda laughed about it, but I was serious! It's strange because the way she's acting (increased tension/sensitivity), her temperature issues, the smell...these are all things we'd associate with impending bad days. However, based on her 11 day cycle and the fact that she just had what we thought were bad days, she should technically be having a stretch of good days right now! I don't know. I have no clue what's going on, but these are definitely not good days. "Off" days at best. Tonight we kept her upstairs to keep her away from her noisy brother, but after he went to bed we were thinking about taking her downstairs. Mike said only a few words to me and that totally set her off! Tears were flowing, the pouty lip was out and the super sad face! Needless to say, we just stayed upstairs and had girl-time the rest of the night! She was very neurologically quirky tonight as well. As she was dozing off she'd stiffen out her arms off and on (she does this occasionally), and then even after a dose of clonidine she was looking very jumpy and restless. I just didn't like the look of it. It all looked very seizure-ish to me. She's had lots of EEGs over the last several years (many of which were done while she was doing some of these quirky off/bad day behaviors) and each one (Thank God) has been getting better and better. 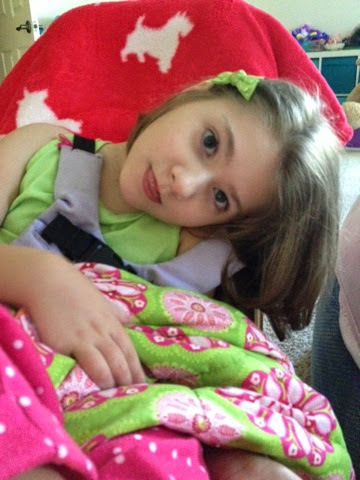 I just think as she continues to grow (and begins to enter puberty...like she is), we are going to have to watch her closely and quite possibly increase her seizure meds (which have been at the same dose since she was 3)! Hopefully, everything we see are just neurologic quirks, but it's just so hard to know. Praying my kooky girl can get some sleep tonight! Tense and "off" but as beautiful as ever! Reagan slept OK last night. She was a little laughy. Waking me up around 1:30am laughing and then again at 4:30 or so. She's been a little goofy today. A little more tense with her laughing...a little more "on edge". She was gagging a little this morning (actual retches), so we did give her a dose of Zofran this am. We had a swim playdate today with a little girl who also has mito and lives in our same town. She's 5 and reminds me so much of Reagan was she was that age. She tried out one of Reagan's swim floats (which she was not too crazy about) and eventually we were able to get everyone into the pool. The girls seemed to enjoy getting out more than getting in, but overall I think they both did really well. 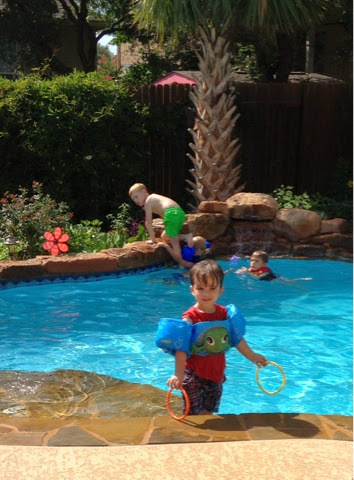 Ryan, of course, just enjoyed the opportunity to get into the pool in the morning (which he never gets to do)! Reagan had an abbreviated session of speech (since she was in the pool for part of it) and then she had school this afternoon. She got a little excited at first with her teacher, but she calmed down and made it through just fine. Tonight she was very vocal and very kooky. She completely flipped out 20min after her nighttime dose of clonidine. Thankfully, a dose of Lortab seemed to counter the effects and she was asleep in less than 10min. Hopefully she'll sleep well tonight and wake up feeling a lot more relaxed tomorrow. Reagan and her nurse Megan! 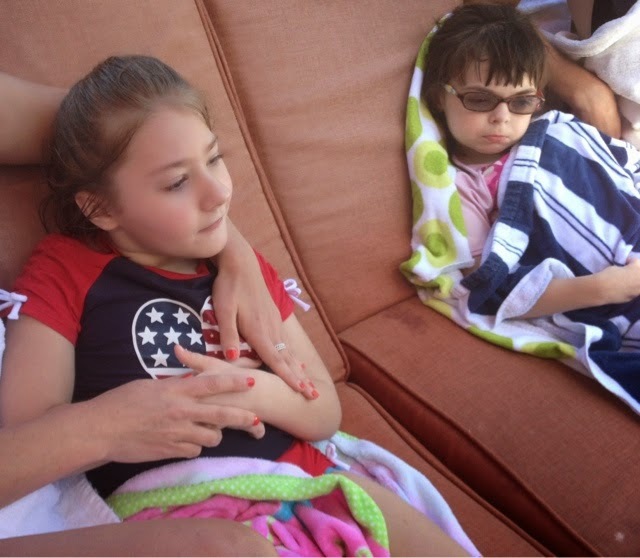 Reagan and Chloe post-swim looking pretty chill! Reagan had a pretty good day today! She was a little laughy, but in a good way! She was laid back all day and (thankfully) that led to her first bowel movement in 7 days! It would seem she's cycling with those as well. When she's tense...nothing happens. As she starts to relax, we have a day or two with several! It's all or nothing with this girl! She only had one therapy today, PT and she did well with that. One slight problem...her therapist had her all AFO'd up and strapped into her stander when we realized the battery is dead (she has an electric stander) and there was no way to get her upright!! We haven't charged it since the move (it obviously holds a charge for quite a while), but we can't find the cord for the charger anywhere! I had to call the DME company and light a fire under them to get someone out to look at it and put in an order for a new cord! (They wanted to send someone out next week, but I gave them such a hard time, they sent someone within the hour!) Hopefully she won't have to go too long without using it! We also need them to readjust it for her when they come back out because she has definitely grown some in the last couple of months! Such a long legged girl! So all in all, it was a laid back sort of day. 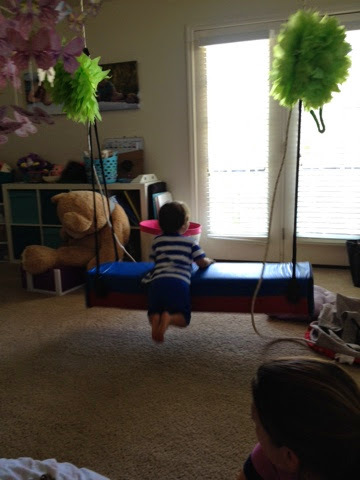 Hanging out, watching cartoons with brother, watching as he went crazy for the Ikea swing we've never used in this house! Good times! She's been a little spitty today but we're going to try discontinuing the Zofran tonight and seeing how she does. Hopefully it's all good from here on out! Reagan has had another sleepy day today. She slept well last night (in her chair), woke up early this morning around 5am laughing, but then dozed back off on her own. She was very laughy this morning...in a crazy laugh sort of way. She never got upset though and even tolerated her speech therapist working with her a bit (in a modified sort of way) and then she dozed back off. She slept most of the day again today. I have to say, I don't mind her sleeping her bad days away, it's way better than seeing her awake and crying and suffering all day. However, her nurse brought up something I've never really considered. She mentioned that kids who are in pain, sometimes sleep to avoid it. She said that in the hospital, when kids are sleeping, they continue giving them their pain meds round the clock...regardless of whether they're sleeping or not. Hmmm, something to think about. We, however, did not give her any pain medications today. Hopefully she didn't need them. Tonight we were even able to transition her to her bed without her waking. Hopefully she'll sleep soundly in her bed tonight and wake up feeling better tomorrow! Sweet sleepy girl! 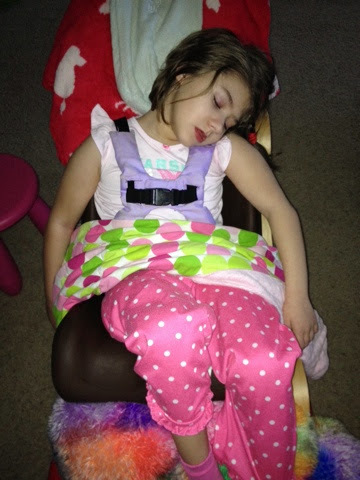 Reagan slept in her chair last night because of her nausea. Thankfully she slept soundly and then woke up without nausea but she was very tense. Trying to bite her hand, lots of erratic movement. She was only awake for an hour or two before dozing back off again on her own. She slept most of the day. Every now and then she'd start thrashing around, but then she'd just doze back off. When she did wake up this afternoon, she was even more tense. She didn't react well to any interaction...it seemed to overstimulate her and she'd laugh in a crazy laugh and then try to bite herself. Oxycodone helped to calm her down and she dozed back off again. She was still asleep tonight when I had to move her to change her and put her in her chair (she had been in her bean bag chair most of the day but there's no way to secure her in it overnight). She woke up a bit crazy and then had a hard time falling back to sleep. Even with clonidine, it took almost an hour for her to settle back down and go back to sleep! I would definitely call this a bad day (this is day 11 since her last). While it wasn't filled with the typical tears and she slept through most of it, you could still tell she was highly stressed and uncomfortable. 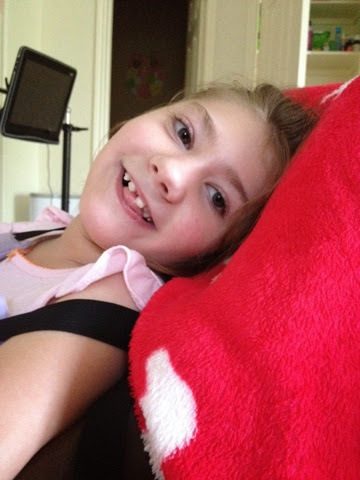 I'm hoping she'll get through this quickly and we'll have our happy smiley girl again very soon! Reagan finally slept in her bed last night! She woke up fairly early, but she was in a decent mood and was happy to just sit and watch cartoons for a bit. She's definitely been more tense today. You can see it in her body and her mood. She's having these bursts of energy where she'll have a lot of chorea and get vocal...not good. She's a lot more sensitive (even flinchy over sudden moves or noises) and she flipped out a little when Mike's sister came up to see her and was talking to her nurse. We had wanted to get her into the pool today now that things are a lot more calm around here, but it just wasn't worth risking a total freakout! She was also a lot more spitty today. Tonight it escalated and while I was holding her she had a big throw up (that even came out her nose)! I gave her clonidine early and it helped her to doze off and avoid any more nausea episodes. We didn't have any choice but to put her to sleep again in her chair...we just couldn't risk her waking up nauseous while laying down. Hopefully she can sleep off the nausea tonight but I have no idea what to expect from her tomorrow. It would definitely seem that we're heading in the wrong direction right now. Please keep her in your prayers! 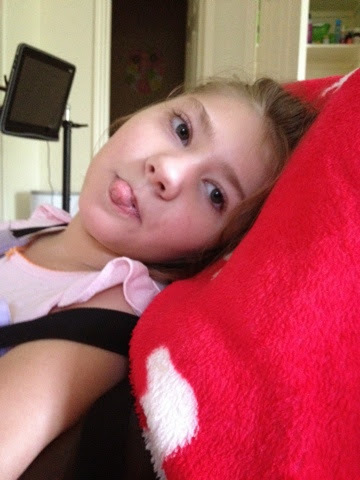 Reagan had another surprisingly good day today! She was super sensitive to Daddy's voice (or any man's voice, she freaked out when Grandpa was talking too), but she got a little better as the day went on. Just to be safe we kept her upstairs when we had people over for July 4th (our next door neighbors, their family, and some of our family). Reagan's nurse was here until 4, so that was really helpful. Overall she was pretty laid back. Giving us the occasional smile, but we had to work for it! Still very tense in her body but calm (except for bursting into tears a few times). Several of the kiddos wanted to go upstairs and see her and she did fine with that. Tonight she even tolerated going out to see the fireworks from our culdesac! She's a lot more laid back tonight and not showing many signs of nausea (just the occasional spittiness or biting her lip)...fingers crossed she sleeps in her bed tonight and wakes up happy tomorrow! Forcing brother to lay beside her for a second! At first Ryan wasn't loving the chaos of all the kids in his pool, but he eventually got used to it! 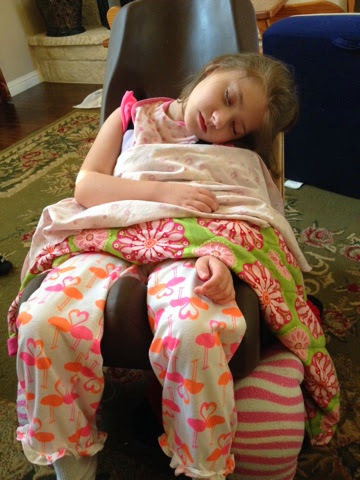 Reagan slept well again (in her chair). She's been good today. A little more nauseous overall (that gets worse and worse as the day goes on)! She only had one therapy today, PT, and she almost slept through it! She's been very still and laid back, but very tense (in her body) at the same time. I know, it sounds contradictory. But her body has been very stiff, arms straight out in from of her and legs that tremor off and on. Thankfully her mood has been good...except for some sensitivity to Daddy's voice! She got all teary anytime he tried to talk to her today! Tonight her nausea was off the charts. Lots of spit, nonstop swallowing, choking and gagging...it was awful to watch! She really fought sleep, but she did finally doze off so I'm hoping she'll stay asleep! Such a darling girl!! Reagan slept well last night (in her chair) and woke up super sweet and calm today. She's been SO still, it's great to see her not in constant movement! She's been super sweet, smiley, and cuddly today. Her nurse has done a good job in keeping her out of her chair (since she's slept in it the last couple nights). She had speech therapy and then school this afternoon and she did great with both! She's so wide eyed and attentive right now, everybody is loving it! Tonight, however, she's gotten increasingly spitty/gaggy. Lots of lip biting, retching, and choking! Not a good recipe for sleeping in her bed! Looks like it's going to be another chair night. Definitely worried about where she's headed...started Zofran. 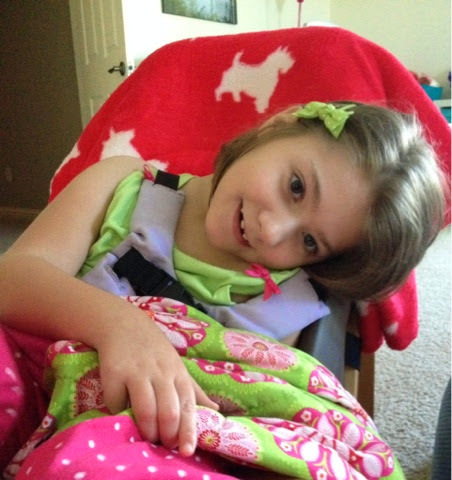 Reagan slept well last night (in her chair) and woke up this morning in a pretty good mood. There was some slight sensitivity to noises, but overall she's been pretty laid back. Arms resting by her side, legs that are almost completely still...a little unusual for my active girl. She had PT and OT today and did really well with both. OT is so impressed with how well she's doing bearing weight through her arms! This afternoon she was getting a little vocal, so we suspected her tummy was bothering her. I helped her to go, so hopefully that will relieve some of the discomfort. Tonight she did have one little mishap when we brought her downstairs. I don't know if it was just overstimulation (her brother was pretty crazy) or the tv noise or Daddy yelling at the soccer game or what, but she started crying and was pretty weepy for a while. I gave her a dose of Lortab and that seemed to take the edge off. It's amazing how she can go from being so relaxed and laid back all day, to tensing up and completely losing it tonight! I also noticed she was biting at her lower lip again tonight...just another sign of increased tension. She was getting sleepy but you could tell she was fighting it. I did finally give her a dose of clonidine, but it didn't seem to help, she was NOT going to sleep in her bed (she was getting vocal and kicking around, but not really fussing like the night before). She dozed off shortly after we put her in her chair. Sometimes I think she just needs that extra support in order to let her body relax. Hoping she'll sleep tonight and wake up happy tomorrow!